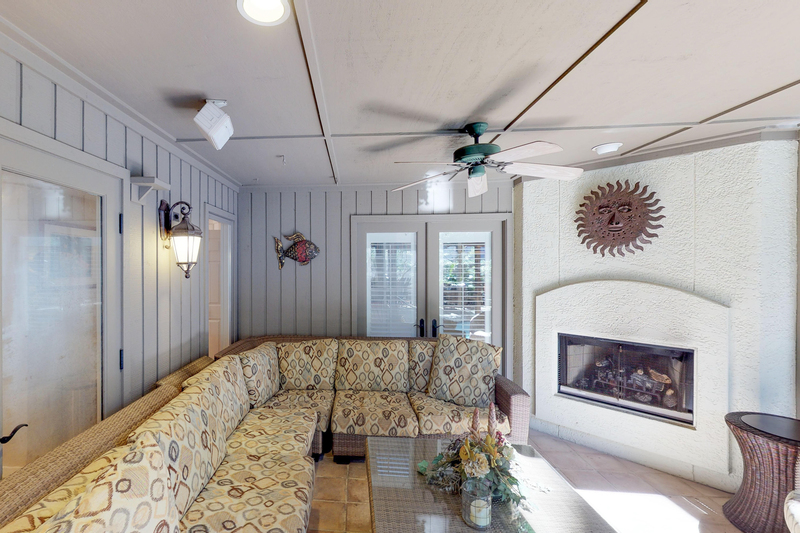 When you enter the front door of Island Oasis you are entering a tropical paradise! 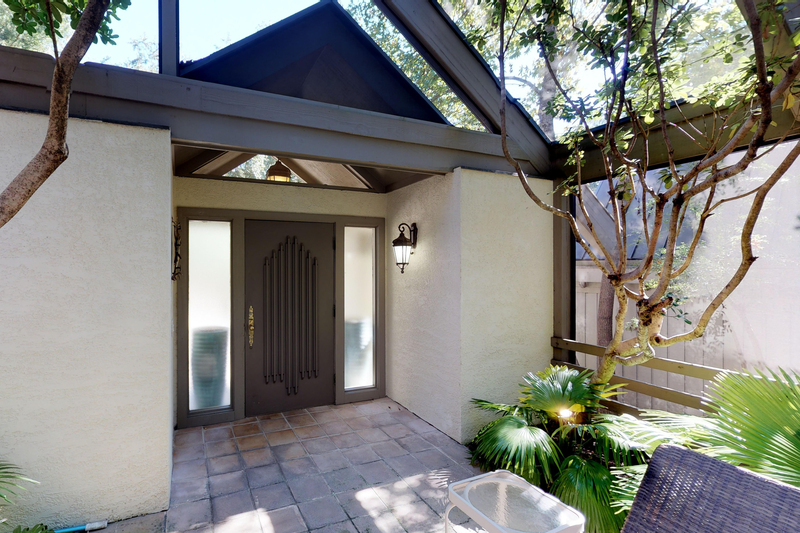 Upon opening the main door to the home you are greeted with the outdoor living space that is completely screened in. 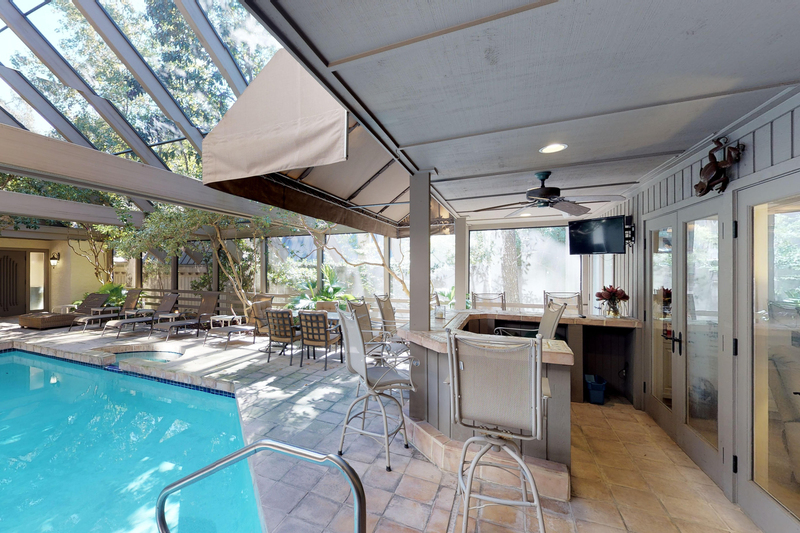 The outdoor living space includes the pool, jacuzzi, an outdoor bar complete with 32" flat screen TV, and plenty of space to sit and unwind. 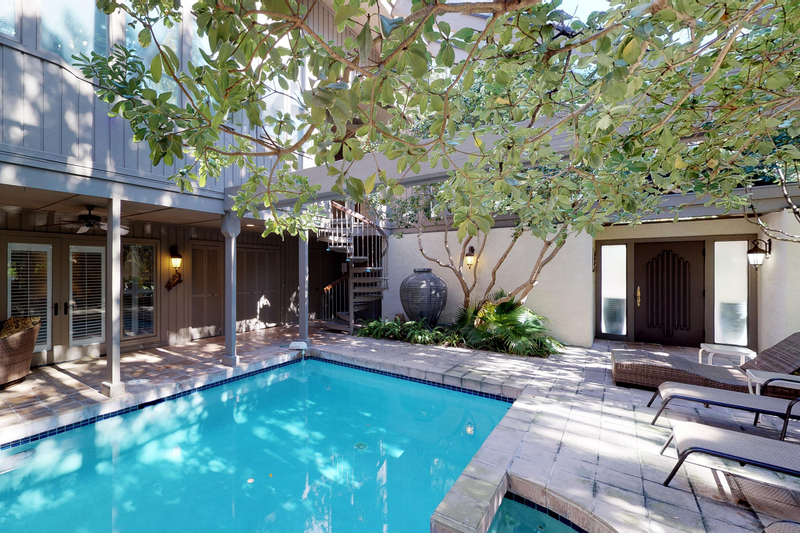 You are in a tropical oasis where you feel like you are one with the nature around you. 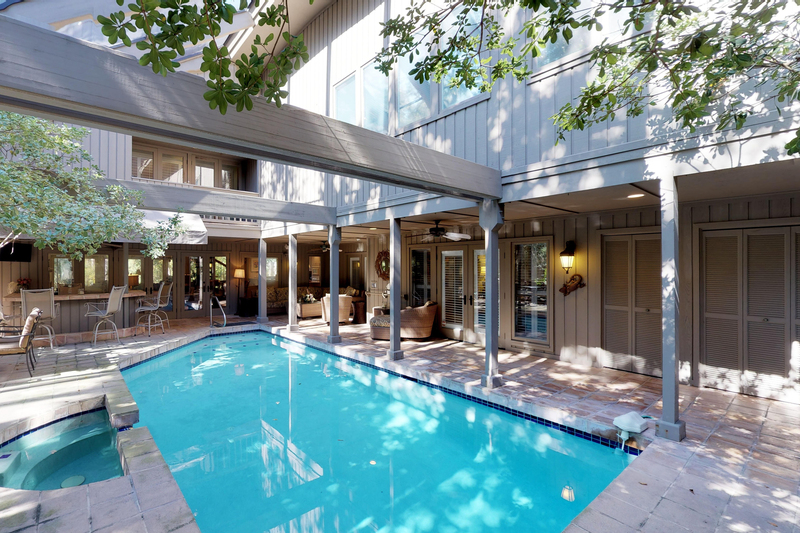 The home is split into two areas; the main home and the in-law suite. 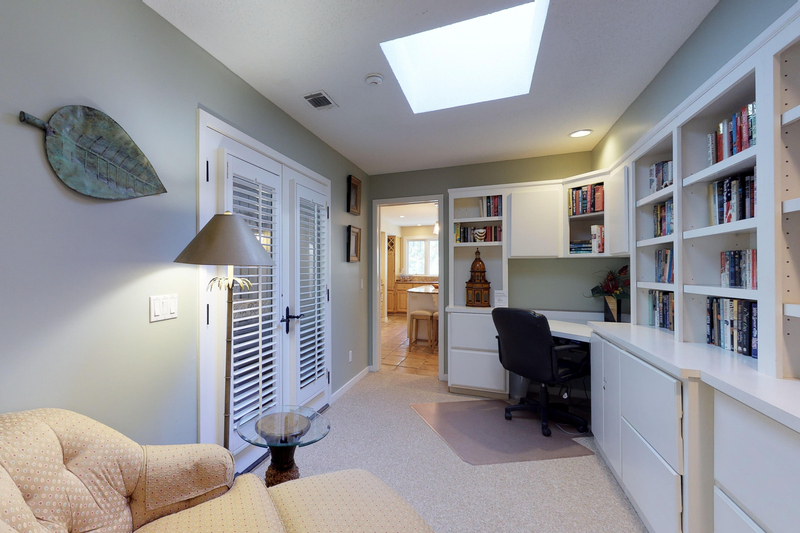 They are separate but connected through the screened atrium. 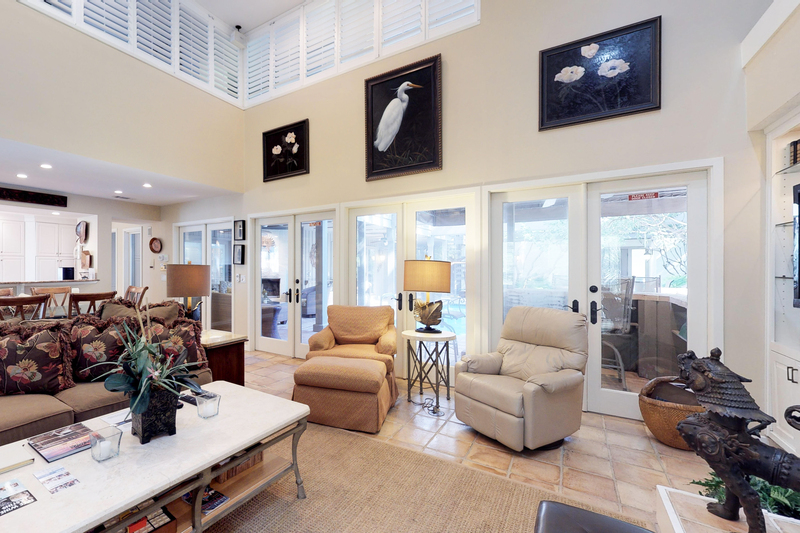 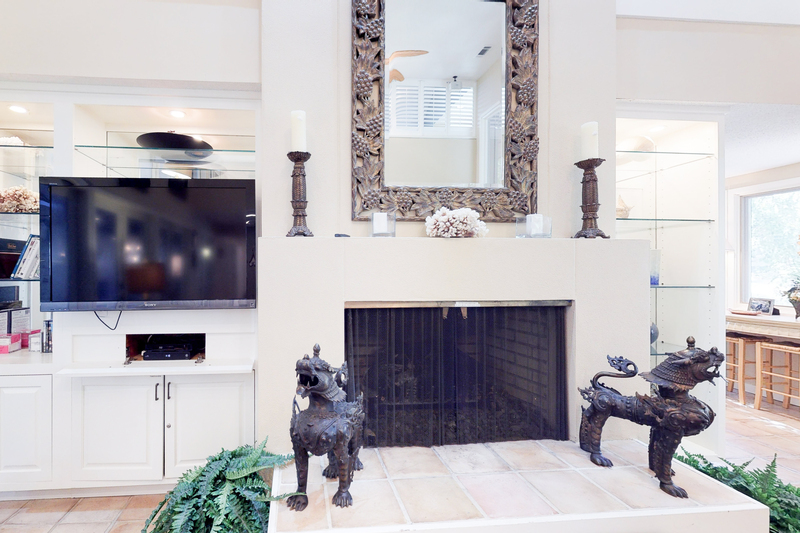 Opening the front door to the main home you will find the living area with views of the pool and atrium on one side and the lagoon and outdoor dining area on the other through 20 foot windows. 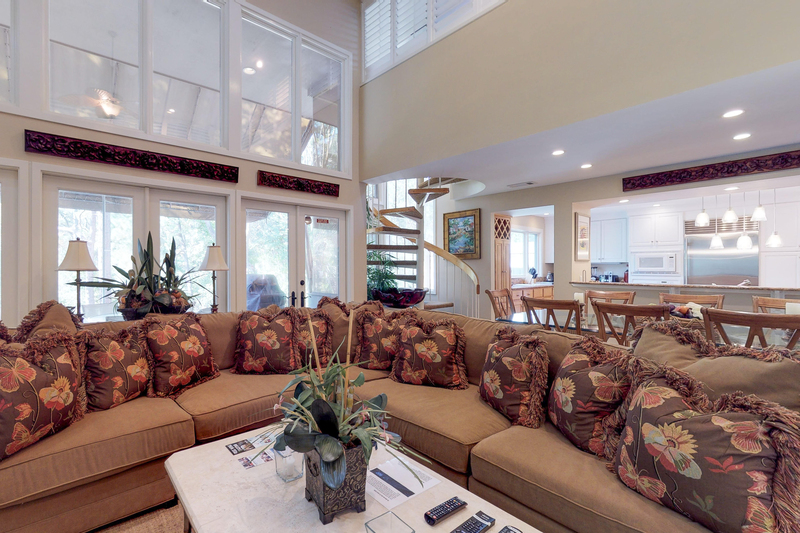 The living area features a sectional sofa and a 46" flat screen TV. 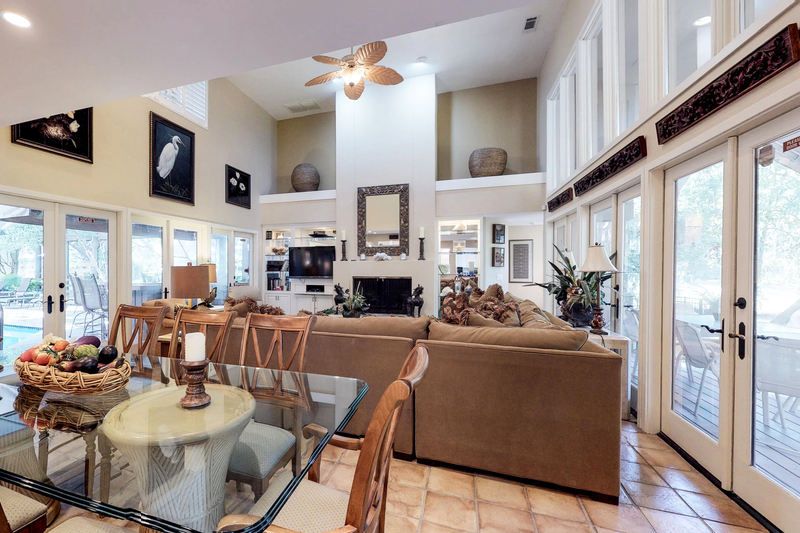 Beyond the living area is the dining area and kitchen. 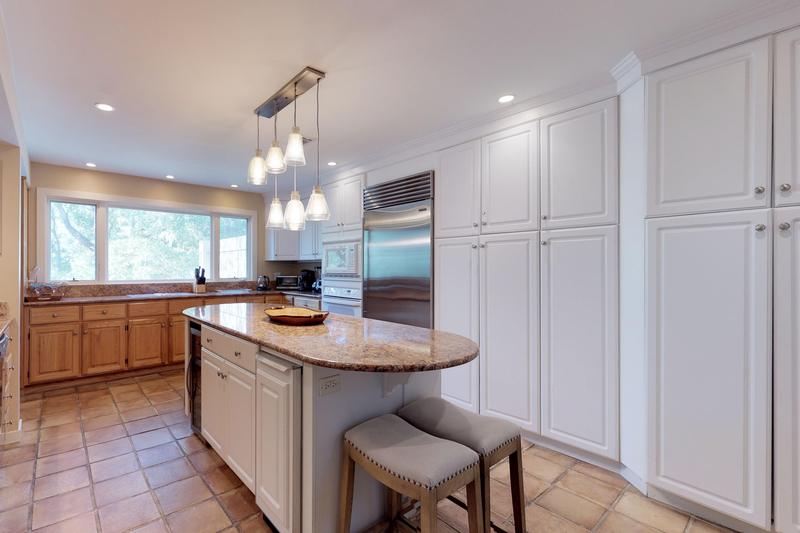 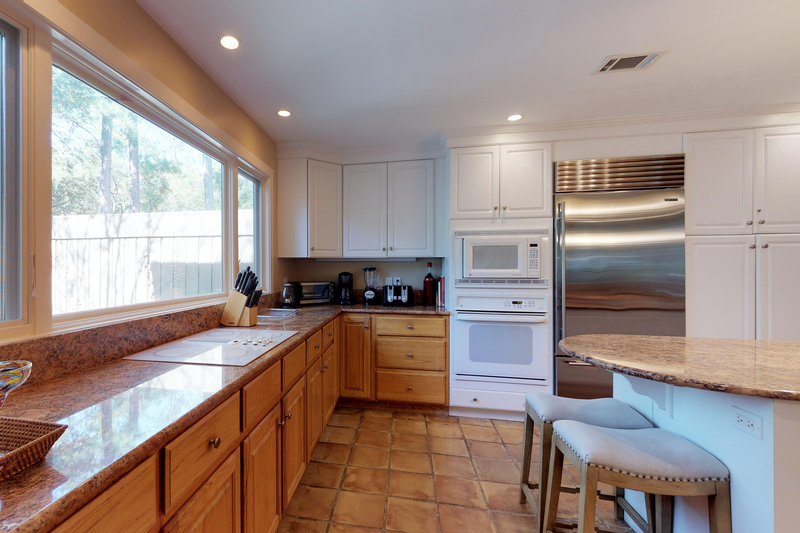 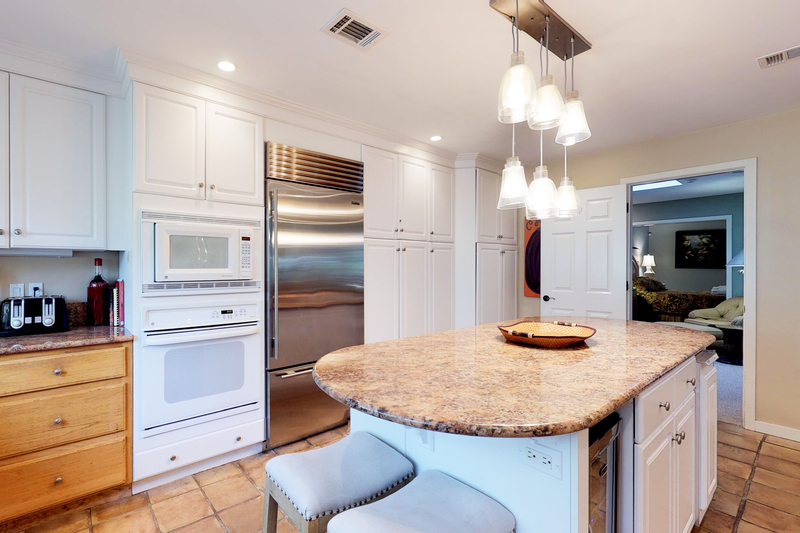 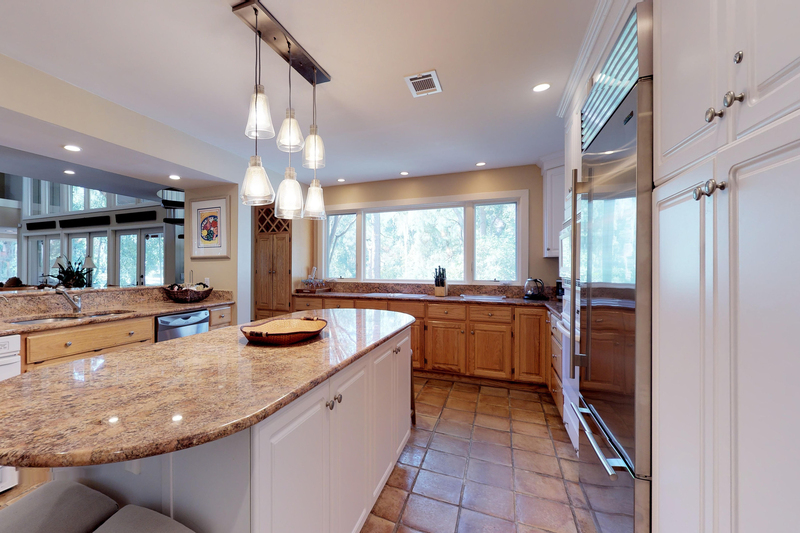 The kitchen features a large island and granite counters. 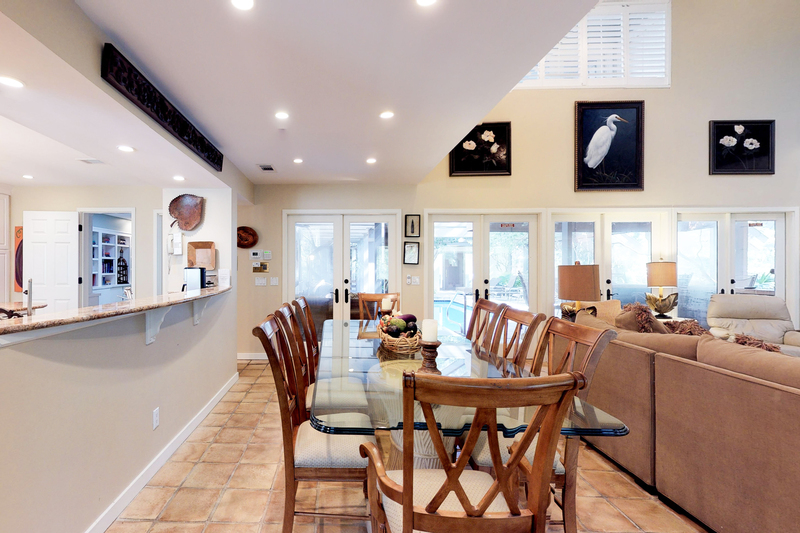 Off of the dining area is the outdoor dining area that overlooks the lagoon with a gas grill. 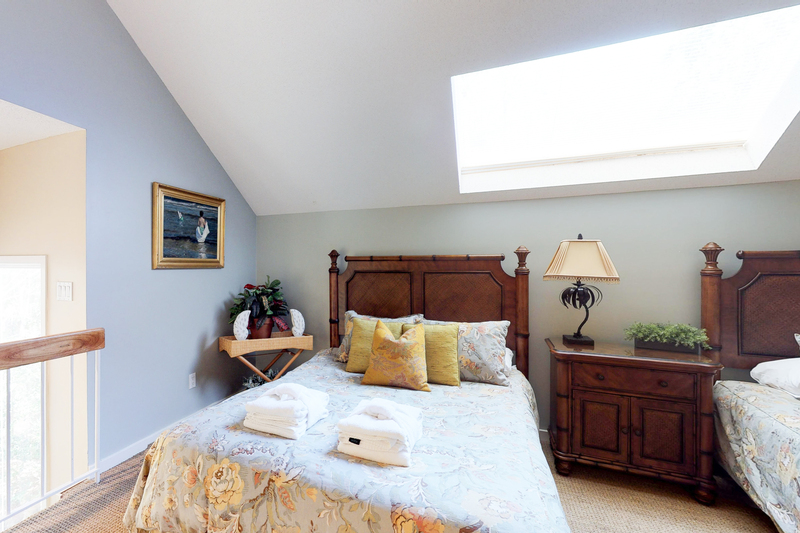 The first of 3 bedroom in the main house is located off of the kitchen. 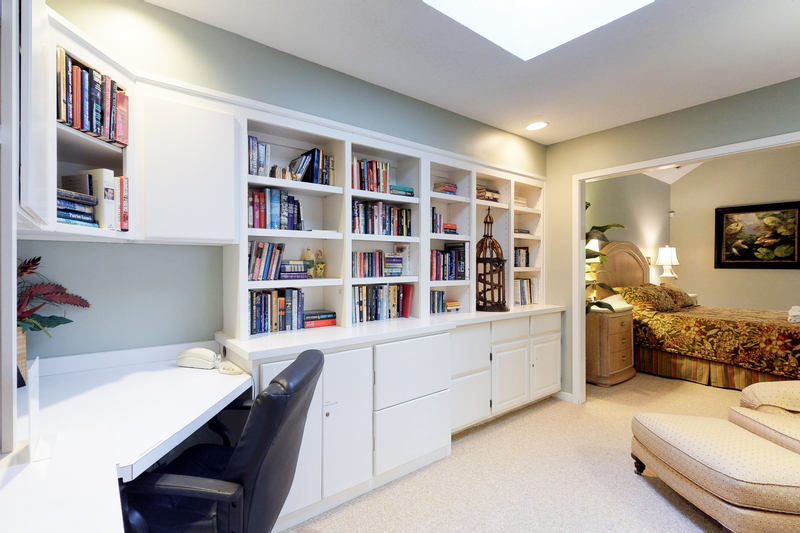 There is a short hallway that leads through a library; for those that work hard and play harder, to the master bedroom. 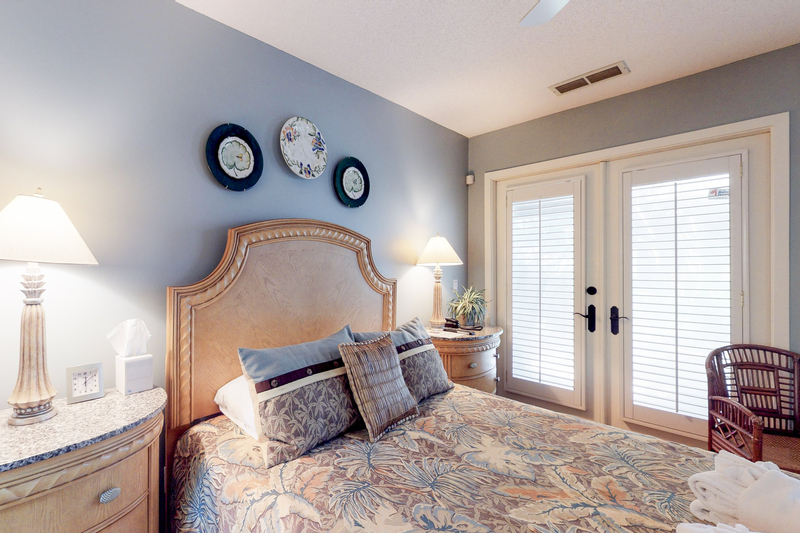 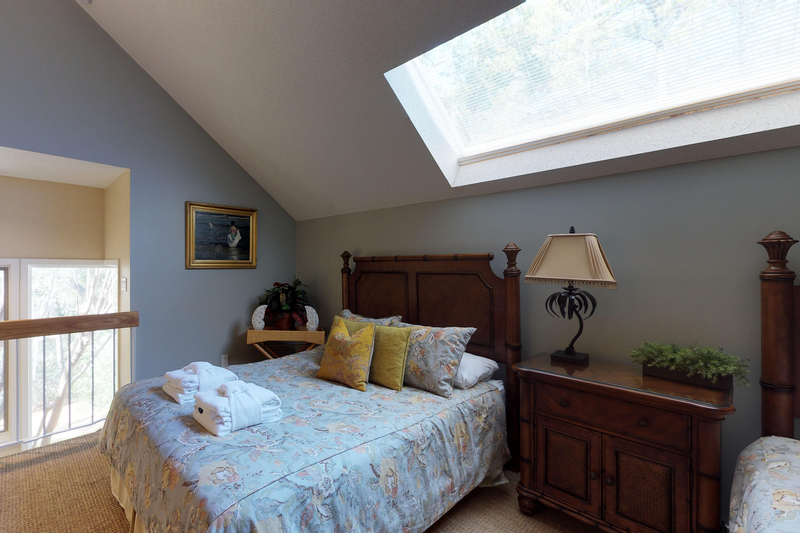 The master bedroom has a king size bed, 40" flat screen and french doors that lead out to the atrium. 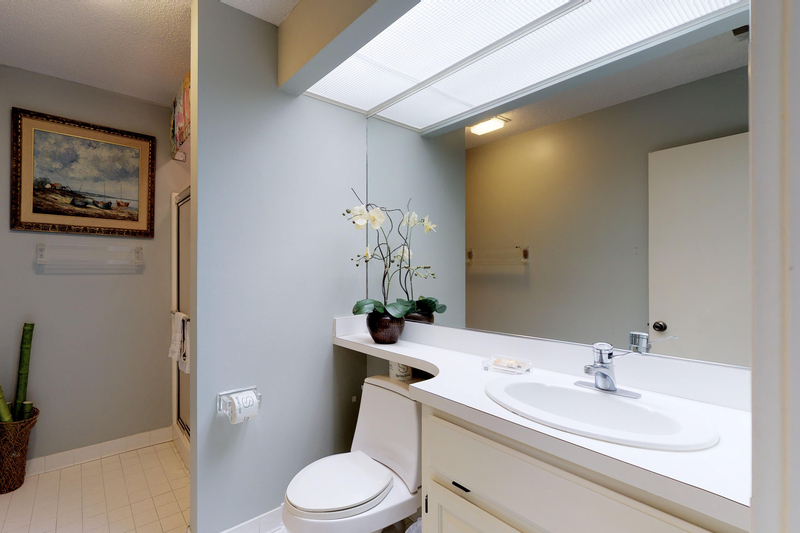 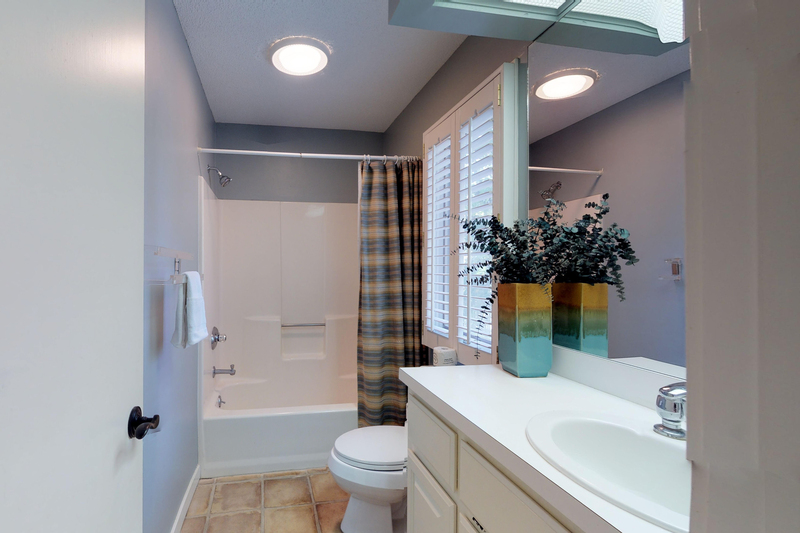 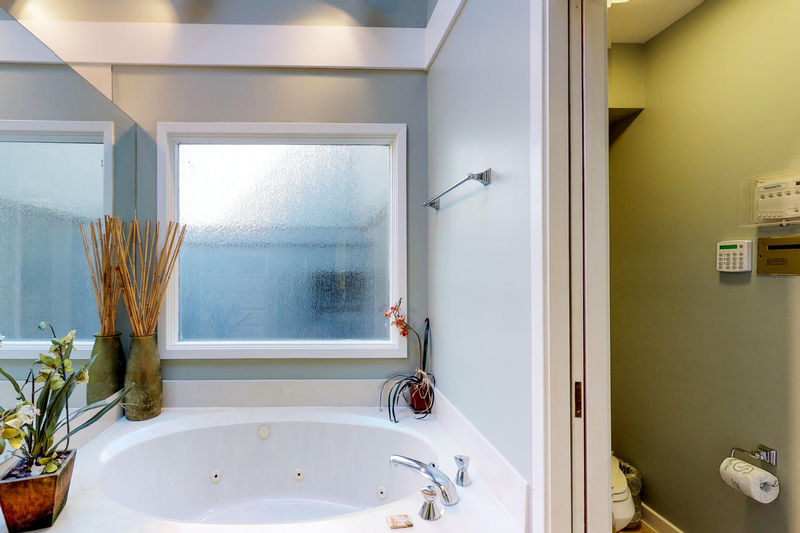 The master bath is private to the room and includes his/her sinks, a jacuzzi tub, and step-in shower. 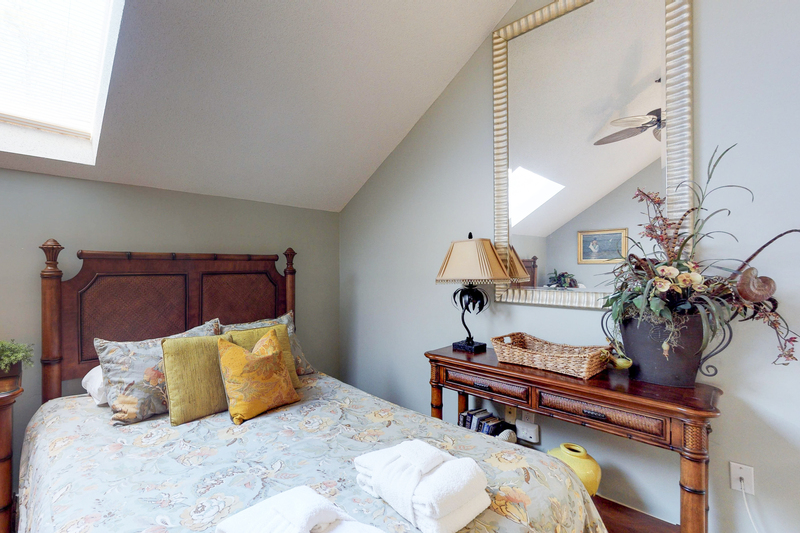 There are two other bedrooms in the main house. 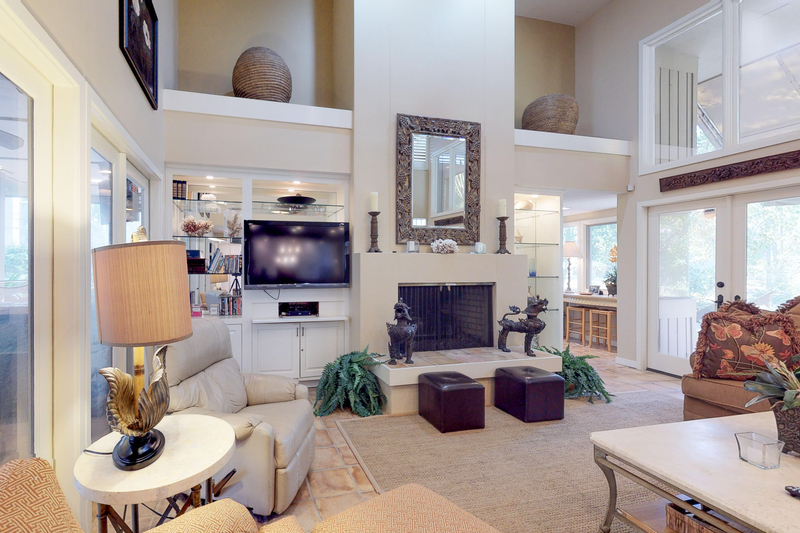 To the left of the main living area is a short hallway with access to a bathroom with a tub/combination. 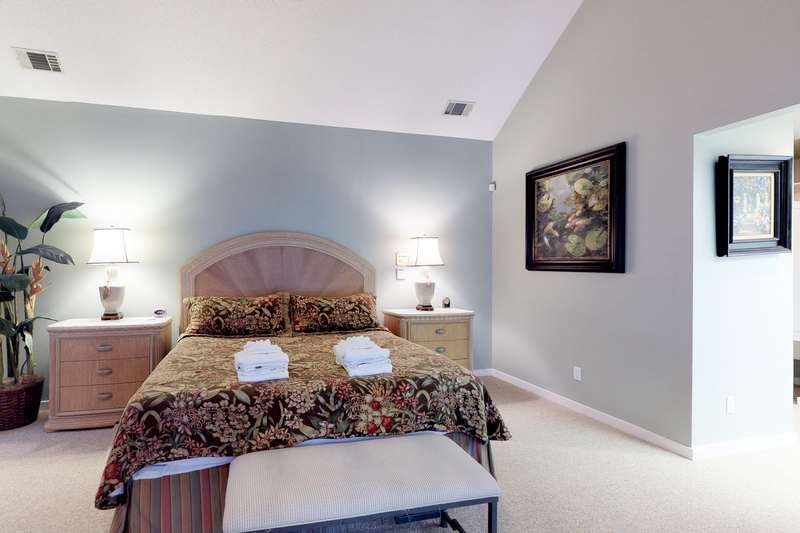 The second bedroom is at the end of the hallway and has a queen bed, 32" flat screen TV, and access to the atrium. 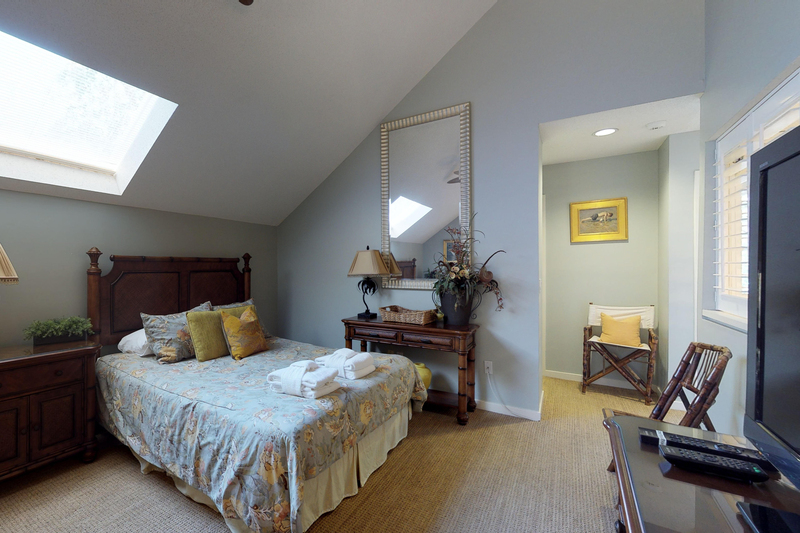 The third bedroom is at the top of a spiral stair case just off of the kitchen. 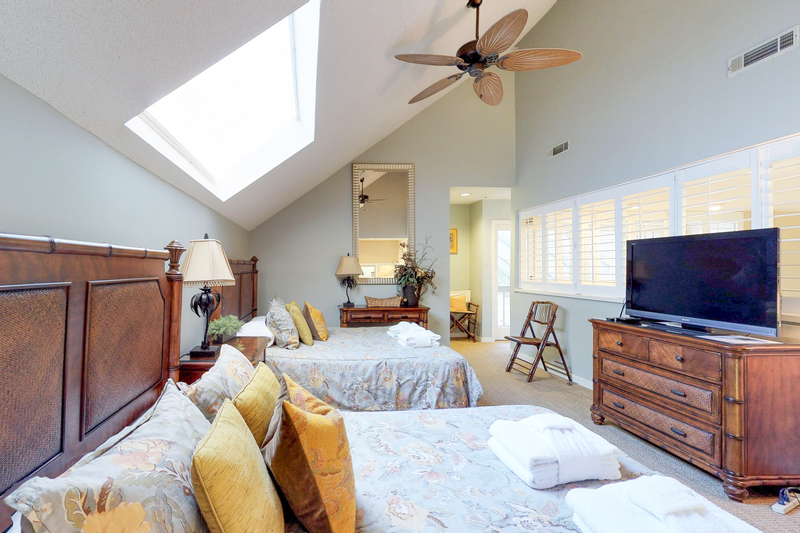 This bedroom has a large sitting area, two queen beds, 40" flat screen TV, and a private bath with step-in shower. 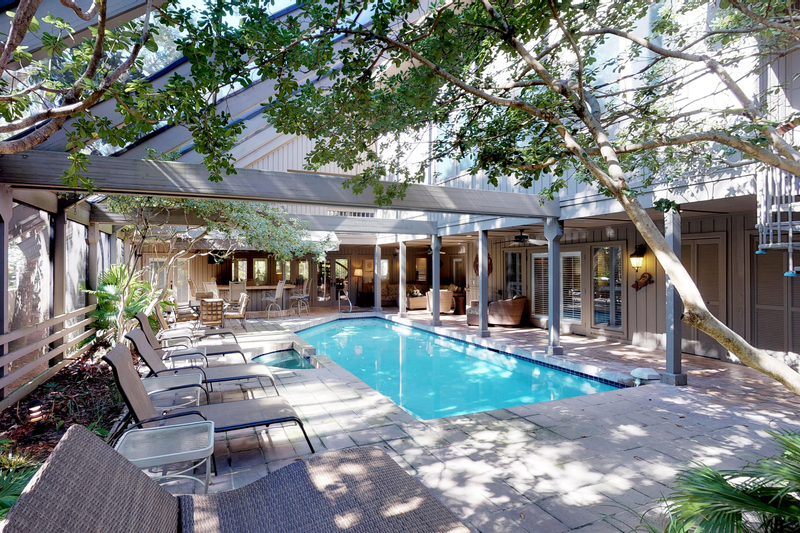 Going back out to the main atruim; there is access to the guest house with two bedrooms that have separate entrances. 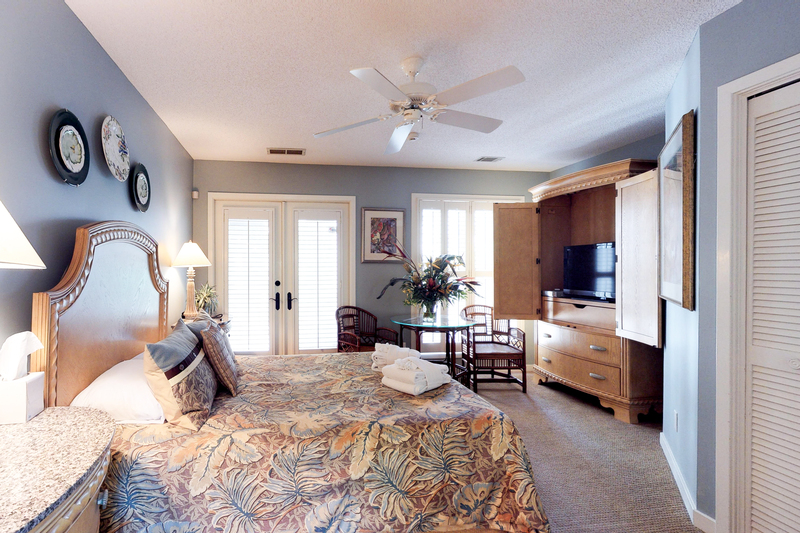 The first is a bedroom with a queen bed, 40" flat screen, day bed, and private bath with step-in shower. 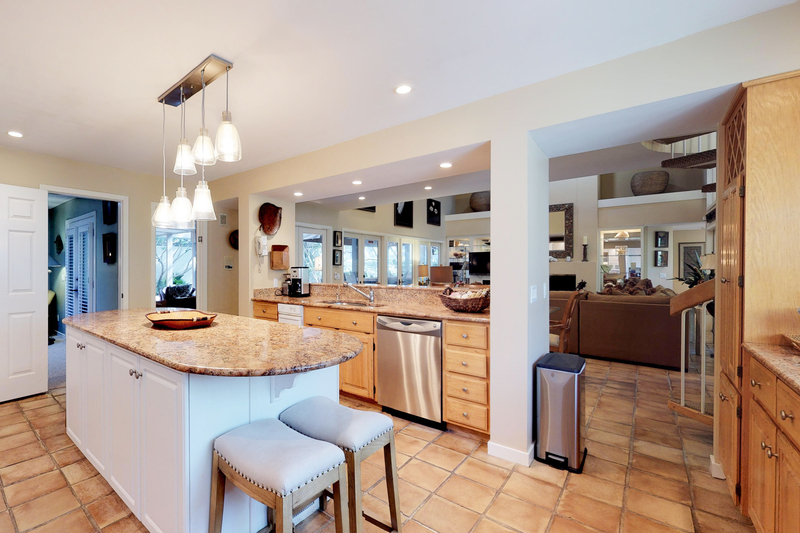 The second is a suite with kitchenette, wet bar, living area, and laundry room. 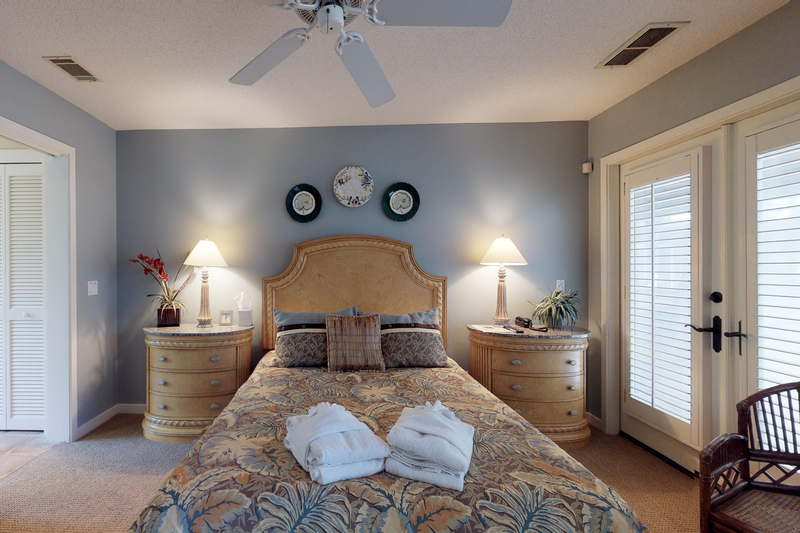 The bedroom has a king size bed, sitting area with two overstuffed chairs, sleeper sofa, 32" flat screen TV, and a private bathroom. 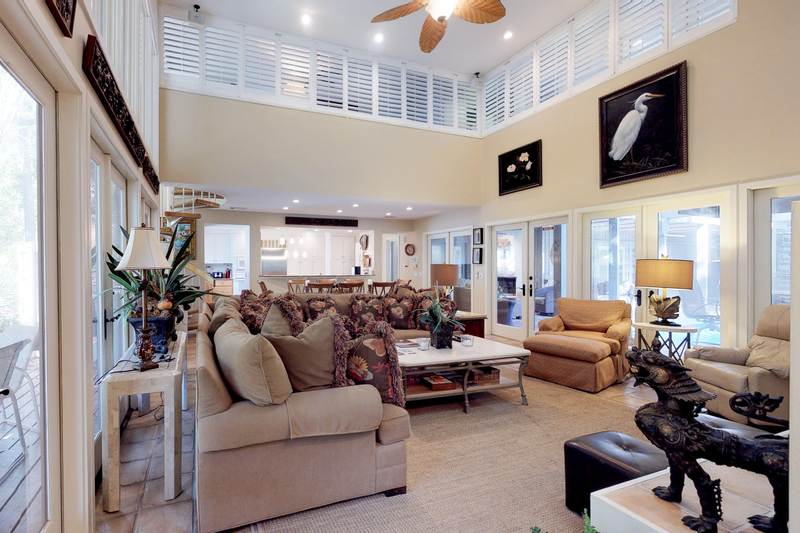 This home features a large outdoor entertainment area with gas grill and outdoor dining overlooking the lagoon and a tropical paradise. 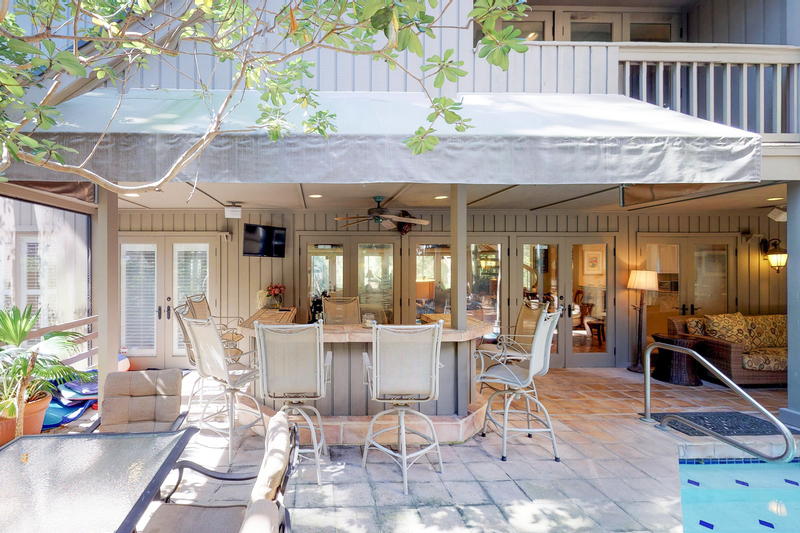 Harbour Town and South beach are just a bike ride away!